We’ve already talked you through what we got wrong on our road trip, now here’s what we got right. And the reason behind revealing our errors is so that you won’t make the same mistakes as us. For similar reasons we’re going to blow our own trumpet here in telling you what we got right, so you can get it right too. When you spend a lot of time on the road you need to make sure the journey’s interesting and that your end point is worthy of any long slogs. For example, Dave rode for well over five hours between Vegas and Bakersfield, but he didn’t mind because the Mojave Desert and a couple of other stop offs made it worthwhile. Similarly, the route from Bakersfield to Yosemite was a long one but definitely worth it for the view on the road up to Yosemite and once Dave arrived in the national park. We think our route was pretty cool and while Interstate 101 and 15 aren’t quite as iconic as Route 66, we think we made the right choices when it comes to destinations. We mixed landscapes and locations, climates and coast and basically covered everything from mountains to deserts and beach, as well as the famous cities and landmarks in California. When Dave Jackson rocked up at Eagle Rider in Las Vegas with a big leather jacket on and the sun beaming down on the desert, he may have questioned the decision to pack for all weathers. But after riding in the desert at dark and riding up into the mountains in Yosemite, the decision to prepare for all weather was one we got right. A jacket is essential as the weather changes quite rapidly in various locations. After 8pm it gets very cold and it’s the same early morning but come lunch time it was way over 25 degrees in some places. Dave took a Buff neck warmer and light riding gloves and both were required. There are lots of touring companies in the States and while we haven’t experienced them all so can’t compare Eagle Rider with them, we were really pleased and impressed with Eagle Rider. First off, the help provided when booking the tour was excellent with thorough plans and outlines for routes provided. Once we got there and our chosen bike was obviously not right for us, it was upgraded and changed with minimum fuss after some great advice from the staff at Eagle Rider. They were also great in sorting us suitable accommodation with some wonderful hotels along the way, including stunning places in Yosemite and Carmel. 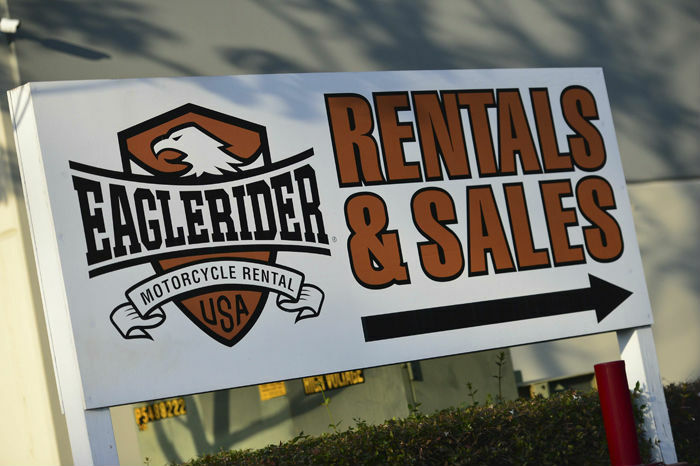 Eagle Rider also provides a jacket hire service for $10 a day and free second hand helmets for your journey – worth doing if you really need to save space when packing. Another plus – if you return your bike to the same depot you picked it up from – is the luggage storage option, where Eagle Rider keep hold of your large suitcase until you return. Fuel was a major concern ahead of the trip, mainly because a lot of the journeys took us along some quite isolated roads where you definitely wouldn’t want to get stranded. And the concern was only heightened by Harley’s reputation as a gas-guzzling manufacturer. 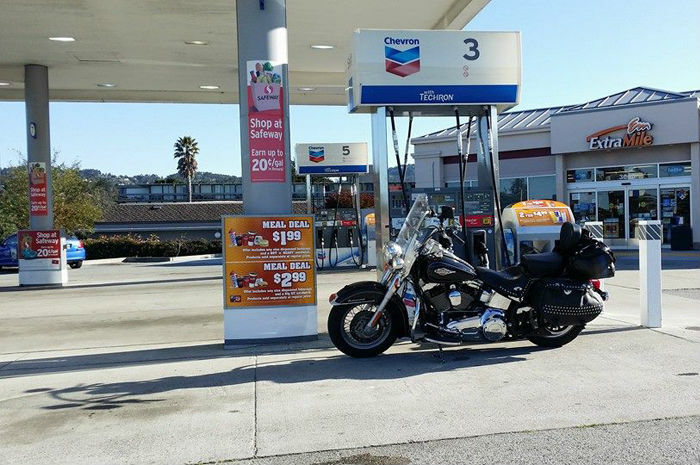 But there was no need to worry because there were plenty of fuel stations along all the major roads, the Harley was much more efficient than we thought it would be and the price of fuel meant it was no financial issue to keep topping the tank up whenever and wherever possible. Parking is not cheap in America, regardless of whether you’re riding a motorbike or not and it’s something that’s worth remembering. For us to leave our bike on the road in San Francisco over night would have cost well over $100. We knew our Stateside jaunt would be fun but not quite as brilliant as it actually was. 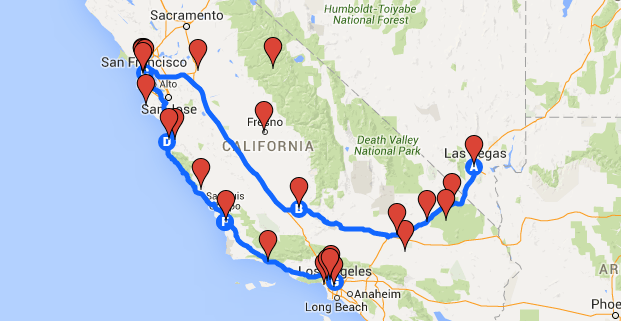 If you can, take a trip round the West Coast of the States, you won’t be disappointed.